There are several websites where you can check the speed of your internet connection but how about the quality of it? You can use Pingtest.net instead. 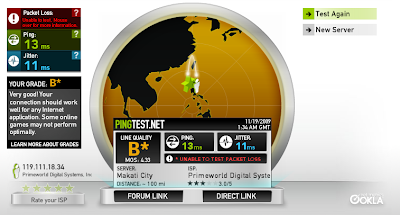 This free web app can determine the quality of your broadband Internet connection by checking packet loss, ping time, and a composite of all the ping tests called jitter (indicator of how much variation exists in your ping times). To use the web app, just go to the website, then click "Begin Test" to start the quality checking. Wait for the process to finish and Pingtest will display the result.